Drift around the corners of the suburban night in your pimped out 5 reel vehicle. Play for fun or stake big to win come unbelievable cash prizes in a game packed with brilliant bonus features, gain huge multipliers in these rounds in this online slots phenomenon that will leave you jumping for joy as you steer your way into the fast cash lane. Net Entertainment (NetEnt) is a leading provider of premium gaming solutions to the most successful online casino operators worldwide. Their team of talented individuals are experts in the field of online gambling and pride themselves on delivering flexible digital casino games, powered by their own cutting-edge, custom platform. You can read more about other NetEnt games in our promotions here. 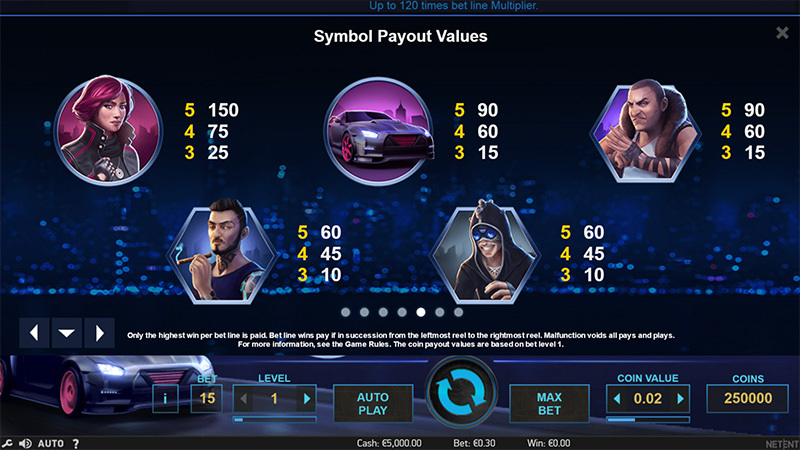 Drive: Multiplier Mayhem is a 15 pay line online video slots game about fast cars and speedsters, running on NetEnt’s custom software platform. 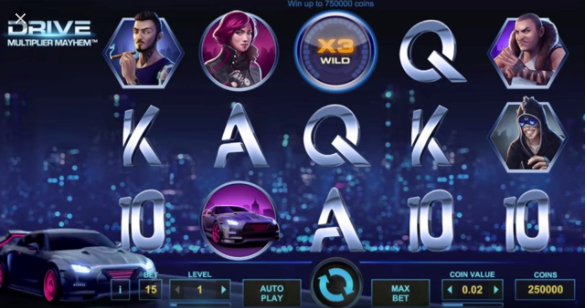 The game features a sleek design and awesome music, along with multiple unique wildcard symbols that set Drive: Multiplier Mayhem apart from the competition. The game features Jette, a female racer with a need for speed. Players must choose their wager in order to help her in her race to beat her opponents. The level of the bet is adjusted using the “Level” button, while the coin size (between 0.01 and 0.5) is set using the “Coin Value” button. To start the game, the player must press the “Spin” button. The “Max Bet” function sets the reels to their highest value and coin size, and “Auto Play” sets the reels in motion automatically for a number of times predetermined by the player. The game features a Multiplier Wild, meaning that if the player lands one of these wilds on a winning pay line, their win is multiplied. If the player manages to land 3 Scatter Symbols they will activate the Free Spins Mode and receive 10 Free Spins. If 3 Nitro Symbols appear on the reels, the player will receive more Free Spins. Both the Scatter Symbol and the Nitro Symbol can only appear on reels 2, 3 and 4. As the player collects Nitro Symbols, their Nitro Collection Metre is filled. 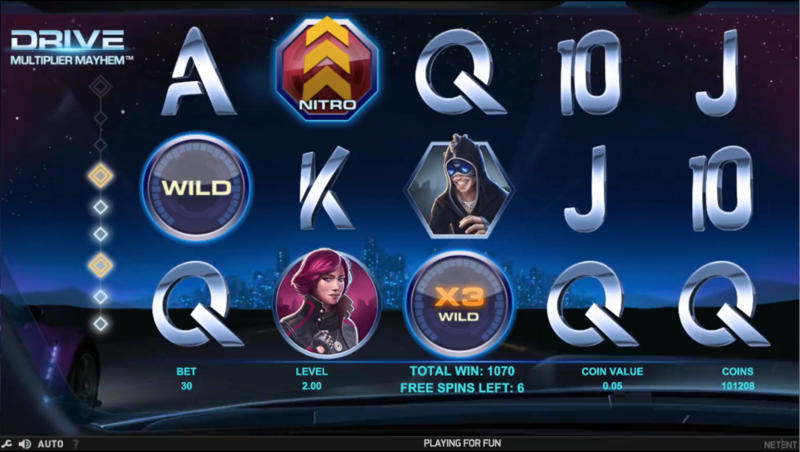 If a Nitro Symbol appears over an Overlay Multiplier Wild, both symbols are counted, so the player will receive the Nitro and the Multiplier Wild. When the Free Spin Mode is enabled, the game will transform and Jette (the player) is set against her first opponent; Twitch. When the player collects 3 Nitro Symbols, they are moved on to the next level. The player is awarded a random multiplier wild, and the next opponent is revealed: Hamaki, or Bruiser (dependent on the player's level). Each time the player reaches a new level, they are awarded more free spins along with another multiplier Wild. Drive: Multiplier Mayhem is a well made, unique title with tonnes of replayability. Even if there wasn't a chance to win money, I would enjoy this game simply due to the levelling system and constant challenge to beat the next opponent. The game has an RTP (Return To Player) of 96.7% and a jackpot of 150 coins. All in all, Id recommend this game to anyone who enjoys unique gameplay with fun mechanics and an awesome aesthetic. The music and visuals are great, the game runs smoothly, and in my opinion, there are no shortcomings. Drive: Multiplier Mayhem is just a great slots game through and through. If you enjoyed Drive: Multiplier Mayhem you might also like Jimi Hendrix Video Slots or to discover more easy slot games Click here.